Schneider H., Okada K., Pask J., in: K. Okada (Ed. ), Mullite and mullite ceramics, John Wiley and Sons Ltd,. Chichester, UK, (1994) ... 97(3) (1997) 105-111. 10. Aksay A., and Pask J.A., Science (Washington, D C.), 183(4120) (1974) 69-71. 11. Jeong Min Parka, Jongun Moona, Jae Wung Baea, Jaimyun Junga, Sunghak Leea,b, .... duction ratio: 78.6%) to break up the initial coarse-grained micro-. May 30, 2018 - Materials Chemistry and Physics 216 (2018) 1â7 ..... granite rock cutting and polishing industries to produce roof tiles, J. Eur. Ceram. Soc. 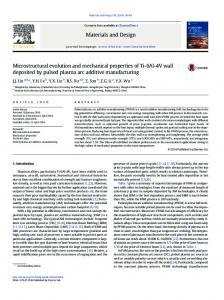 28 Jun 2018 - sheets were fabricated using spark plasma sintering (SPS) ... cm. 2. /VÂ·S) , thermal (5 Ã10. 3. W/mÂ·K)  and mechanical (1 TPa of .... marked in Fig. (a). 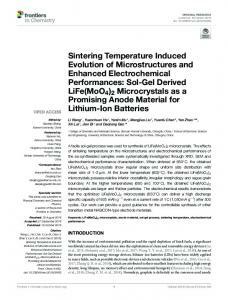 ... the sintering can be expressed as follows :. ( ) ( )Î¼ Ï ÏÎ¼ Îµ Îµ n. kT b. G ..... China and the funded by Northwest Institute for Nonferrous Metal Research. To appear in: Ceramics International Received date: 11 June 2018 Revised date: 28 June 2018 Accepted date: 28 June 2018 Cite this article as: L.L. Dong, B. Xiao, Y. Liu, Y.L. Li, Y.Q. Fu, Y.Q. Zhao and Y.S. 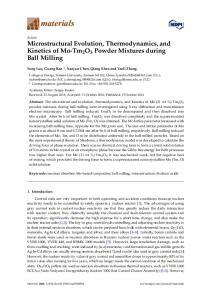 Zhang, Sintering effect on microstructural evolution and mechanical properties of spark plasma sintered Ti matrix composites reinforced by reduced graphene oxides, Ceramics International, https://doi.org/10.1016/j.ceramint.2018.06.252 This is a PDF file of an unedited manuscript that has been accepted for publication. As a service to our customers we are providing this early version of the manuscript. The manuscript will undergo copyediting, typesetting, and review of the resulting galley proof before it is published in its final citable form. Please note that during the production process errors may be discovered which could affect the content, and all legal disclaimers that apply to the journal pertain. vacuum, and the structure of rGO was retained. At the same time, the reaction between Ti matrix and rGO at such high sintering temperatures resulted in uniform distribution of micro/nano TiC particle inside the rGO/Ti composites. The sintered rGO/Ti composites exhibited the best mechanical properties at the sintering temperature of 1000oC, obtaining the values of micro-hardness, ultimate tensile strength, 0.2% yield strength of 224 HV, 535 MPa and 446 MPa, respectively. These are much higher than the composites sintered at the temperature of 900oC. The fracture mode of the composites was found to change from a predominate trans-granular mode at low sintering temperatures to a ductile fracture mode with quasi-cleavage at higher temperatures, which is consistent with the theoretical calculations. 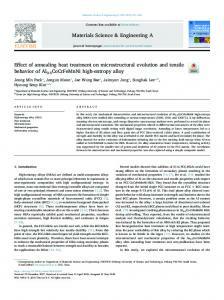 properties after sintering at different temperatures were studied, and the strengthening sintering mechanism was discussed based on theoretical analysis. 2. Experimental procedure 2.1 Materials Graphene oxide (GO) was purchased from Western Superconducting Technologies Co., Ltd., China. Fig. 1(a) is an SEM image of the GO which shows a crumpled sheet structure. Pure spherical Ti powder (with purity＞99.9% and a mean diameter of ~150 μm), as shown in Fig. 1(b), was used as the matrix materials. The image reveals that there is no agglomeration of Ti powder particles and they are spherical in shape. pressure of 45 MPa in a vacuum atmosphere. The temperature was controlled with a thermocouple placed in the graphite mould which was located 2 mm away from the sample. The heating rate was 100oC/min. (f) The sample was cooled down to room temperature in the furnace. The compressive/tensile tests were carried out at room temperature using an MTS810 universal testing machine with a strain rate of 1×10-3 s-1. At least three measurements were performed to acquire an average value. The tensile fracture surface morphologies and composition were characterized using the SEM equipped with an energy dispersive X-ray spectroscope (EDS). Fig. 3 shows the schematic diagram and macrophotograph of tensile samples, respectively. 3. Results and discussion 3.1 Mixed powders SEM micrographs of GO/Ti composite powders are displayed in Fig. 4. The GO was effectively absorbed on the surfaces of spherical Ti powders, as shown in Fig. 4(a). Also, agglomeration of the GO was also observed, as shown in the red rectangle marked in Fig. (a). Fig. 4(b) is an enlarged view of this area, which suggests that the transparent and crumpled structure of the GO was not obvious, revealing that most of the GO sheets are attached to the surface of Ti matrix powders. graphene materials. As shown in Fig. 10(e), all the sintered rGO/Ti composites exhibit an intense D band at ~ 1350 cm-1 and G band at ~ 1595 cm-1, also the intensities of D and G bands become much higher with an increase in sintering temperature except for 1100 oC. The obtained ratios of ID/IG are listed in the inset of Fig. 10(e), and they are increased from 1.26 to 1.56 when the temperature is increased to 1000 oC, which suggests that the graphene structure has been degraded. However, the broad 2D band at 2680 cm-1 for Ti-1000-0.6C sample is clearly observed in Fig. 10, implying that the GO was reduced at 1100oC and there are still remained intact reduced graphene structures in the rGO/Ti composites. To our knowledge, the existence of 2D peak is often used to confirm the presence of graphene and determine the number of graphene layers. For a single layered graphene, the 2D peak is quite narrow and relatively sharp, however it becomes broadened and displays peak-splitting with an increase in the number of graphene layers . The rGO in this work clearly are multiple layer structures after the SPS. However, the intensity of 2D peak of the sample of Ti-1000-0.6C is much higher than those of others, suggesting that the structure of rGO is still retained in the sintered composites of the Ti-1000-0.6C after SPS. 3.4 Fracture morphology of sintered rGO/Ti composites SEM fracture morphologies of the rGO/Ti composites sintered at different temperatures are shown in Fig. 13. A number of rock-candy shapes of grains and numerous pores are clearly observed at the low sintering temperatures (e.g., 800oC and 900oC), as described in Figs. 13(a) and 13(b), which suggests ineffective sintering process occurred at such a low SPS temperature. This can be confirmed from the trans-granular fracture surfaces of the sample as shown in Figs. 13(a) and 13(b). Some layered structure of un-sintered rGO at the Ti-Ti grain boundaries can be observed. With an increase in the sintering temperature, the fracture morphology of composites is significantly changed. The large size pores among the Ti grain boundaries disappear as shown in Figs. 13(c) and 13(d). However, some dimples with an average size of 8 μm are exhibited on the fracture surface of the composites, and a ductile fracture mode with a feature of quasi-cleavage is observed, which is corresponding to a high toughness value for the Ti-1100-0.6C composites (in Fig. 12(c)). Further observation in Fig. 13(d) reveals the presence of pull-out of the TiC phase (determined by the EDS results in Fig. 13(e)), showing the trans-granular fracture phenomenon. The presence of TiC particles is actually beneficial for the further improvement of mechanical properties for the composites . This is consistent with the analysis and conclusions obtained in Section 3.3. Ti matrix composites containing 0.6 wt.% rGO sheets were successfully prepared using the SPS at various sintering temperatures. 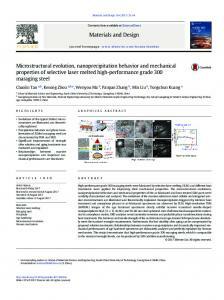 The effects of SPS sintering temperature on the microstructure and mechanical properties of rGO/Ti composites were studied in this work. The following conclusions can be obtained: (1) With an increase in the sintering temperature, the relative density and densification were improved, and the Ti grains were refined owing to the presence of rGO. 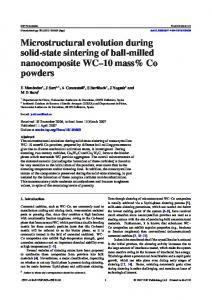 However, the optimum sintering temperature was 1000 oC for 5 min under 45 MPa in a vacuum, and the structure of rGO can be retained. The reaction between Ti matrix and rGO has occurred, forming micro/nano TiC particle uniformly dispersed in the rGO/Ti composites at the high sintering temperature of 1000oC. (2) The sintered rGO/Ti composites exhibited the best comprehensive properties at the sintering temperature of 1000 oC. The micro-hardness, ultimate tensile strength and 0.2% yield strength sintered at the temperature of 1000 oC were 224 HV, 535 MPa and 446 MPa, respectively, which were higher at 24.5%, 12.9% and 11.5%, respectively, as compared to those of the composites sintered at the temperature of 900 oC. (3) The fracture mode of composites changed from predominately trans-granular mode at low sintered temperature to ductile fracture mode with quasi-cleavage at higher temperature. The changes of fracture modes were consistent with the theoretical calculations. This work was supported by the National Security Major Basic Research Plan of China and the funded by Northwest Institute for Nonferrous Metal Research (K1652-11), National Natural Science Foundation of China (Grant No. U1737108), the Natural Science Basic Research Plan in ShaanXi Province of China (2017ZDJC-19), Innovation team in key areas of Shaanxi Province (2016KCT-30) and UK Newton Mobility Grant (IE161019) through Royal Society and the National Natural Science Foundation of China, as well as Royal academy of Engineering UK-Research Exchange with China and India. D. Jeyasimman, S. Sivasankaran, K. Sivaprasad, R. Narayanasamy, R.S. Kambali, An investigation of the synthesis, consolidation and mechanical behaviour of Al 6061 nanocomposites reinforced by TiC via mechanical alloying, Mat. Des. 57 (2014) 394–404. X. Yu, Z. Zhang, F. Liu, Y. Ren, Synthesis of transfer-free graphene on cemented carbide surface, Sci. Rep.-UK, 8 (2018) 4759-4568. M.S. Dresselhaus, A. Jorio, M. Hofmann, G. Dresselhaus, R. Saito, Perspectives on carbon nanotubes and graphene Raman spectroscopy, Nano Lett. (10) (2010) 751–758. K. Kondoh, T. Threrujirapapong, H. Imai, J. Umeda, B. Fugetsu, Characteristics of powder metallurgy pure titanium matrix composite reinforced with multi-wall carbon nanotubes, Compos. Sci. Technol. 69 (2009) 1077-1081. Fig. 13 SEM fracture morphology of rGO/Ti composites sintered at different temperatures: (a) 800 oC, (b) 900 oC, (c) 1000 oC, (d) 1100 oC, respectively. (e) EDS result of the red arrow positions marked in Fig. 13 (d). Fig. 1 SEM micrographs of the source materials. (a) graphene oxide, (b) Ti powder. Fig. 2 Schematic illustration of fabrication process of the rGO/Ti composites using SPS. Fig. 3 (a) Schematic diagram and (b) photo of a tensile sample. Fig. 4 (a) SEM images of GO/Ti mixture powders and (b) an enlarged view of red rectangle position marked in 4(a). (a) 800oC, (b) 900oC, (c) 1000 oC and (d) 1100 oC, respectively. Fig. 7 SEM image (a) and (b0)~(b2) EDS mapping results of rGO/Ti composites SPS at 1000 oC. Fig. 8 Effective pressure index (n) obtained from equation (8), presented by the slope of different fitted curves. 2theta (deg.) Fig. 9 XRD patterns of the rGO/Ti composites sintered at the different temperature. Wavenumber (cm ) Fig. 10 Raman mapping of the 0.6wt.% rGO/Ti matrix SPSed composites at different temperature (size of 60×60 μm2): (a) 800oC; (b) 900oC; (c) 1000oC; (d) 1100oC, (e) The Raman spectra of point a, b, c, and d which is one of the four mapping region, respectively. 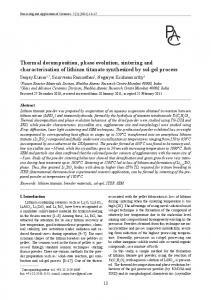 Report "Sintering effect on microstructural evolution and"